Bulk Updater is a web application that allows you to update in bulk the properties (also called metadata) of your AODocs documents. Only library administrators and super administrators can use Bulk Updater. Bulk Updater requires two sets of permissions from the user. 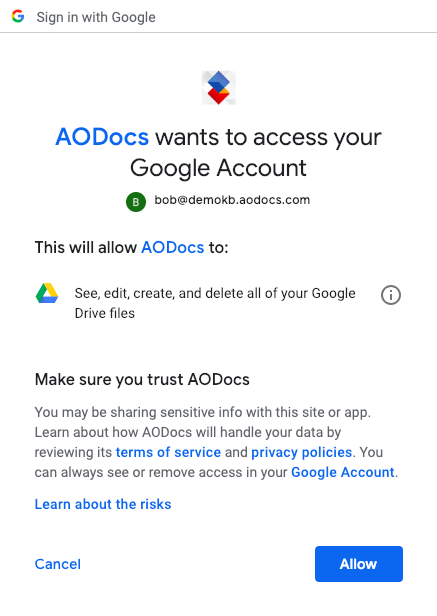 When you access Bulk Updater the first time, AODocs prompts you to sign in with Google. When you're signed in, AODocs prompts you to grant access to Bulk Updater. Press Allow to grant Bulk Updater permission to create spreadsheets for you.